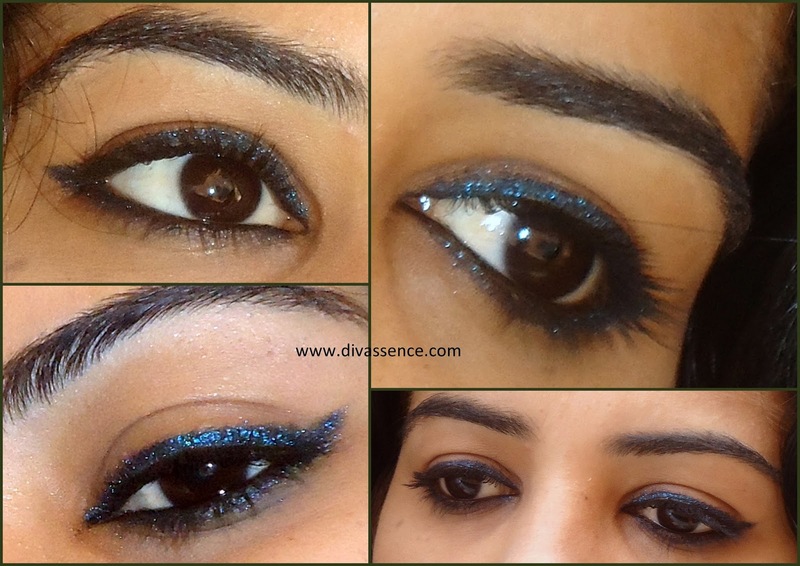 Ikonic Salon Solutions Gel Eye Liner Pencil: Black Spark: Review/Swatch/EOTD - Divassence! By NidsI have found my new eye liner love in the Ikonic Gel Eyeliner pencils. The shades, the texture, the staying power and the price make these unbeatable among the other competitors. Packaging: The wooden pencil is easy to sharpen. It has a clear color indicator at the other end and the tip is secured with a plastic cap of the same color that helps in easy identification too. Shade: Black spark as the name suggest is a dark black color with a lot of navy blue/teal shimmer. The color is absolutely gorgeous and one of the best in the whole collection. I wear it most of the time as it pairs well with black and blue and also other colored outfits very well. The shimmer is not too dazzling during the day and looks perfect for night outs. Texture & pigmentation: The gel pencil liner is soft and smooth in application and quite intense in pigmentation. The creamy texture allows you to apply the liner easily and a single stroke would give the desired color pay-off. But the pencil gets used up very easily so you may find a need to sharpen it after every use. The shimmer looks great but use a proper make up remover or a good cleanser so as not to leave any shimmer behind. Longevity: The pencil stays on as long as you want it to on your eyes. It hardly fades or smudges once set. But rubbing it off may cause it to fade a little. It is waterproof but again don’t rub off the liner during the time it takes to set. .
Stays on for 7-8 hour easily. Does not fade or smudge. Rubbing the eyes accidentally may fade the color. One may have to sharpen the pencil frequently which results in wastage. Shimmer may be left behind if not removed properly. The Kryolan website does not mention these pencils anywhere. These are sold only in the Kryolan Mumbai outlet. Final word: This color and the pencils in general are recommended if you are an eye pencil lover. These are definitely a must have in your vanity. Creamy and pigmented with lovely shade selection make these pencils very appealing.